LOS ANGELES – Team leader Hailey Pacheco, 8, bustles around the small table, checking the answers of her Hoover Street Elementary School third-grade teammates as they play a board game in which students earn turns by correctly drawing inferences after reading paragraphs. “Hailey, did I get it correct?” a boy calls out, explaining how he arrived at his answer. Hailey grabs her team leader answer sheet and lets him know he’s correct, and he rolls the dice for his turn on the gameboard. “We won’t know who’s won until we’re done,” Hailey says. Hailey is in one of four groups of students separated based on performance on numerous school indicators for an hour of daily targeted lessons on priority learning standards. The groups range from advanced, such as Hailey’s, to those requiring intensive help. The groups allow teachers to focus on students’ specific needs based on each group’s current level of achievement. It’s part of a six-year effort by Hoover Street Elementary leaders to transform what had been a struggling neighborhood school into one of the gems of Los Angeles Unified. Educators credit the turnaround to a partnership with Principal’s Exchange, an education consultant that empowers teachers to transform their instructional approaches. Just one indicator: 53 percent of Hoover Street students scored proficient or better on the state’s most recent English language arts test and 48 percent hit that mark on the state’s math test. Those numbers outstrip other neighborhood schools, as well as county and state averages. When Avelar arrived in 2009-10, state test scores mirrored those of other schools in Los Angeles’ tough McArthur Park neighborhood. Hoover Street scored a 701 on the Academic Performance Index then in use – well below state standards – and was in federal Program Improvement status. Principal’s Exchange guides schools in creating systemic changes to instructional approaches, relying on detailed student-level data to help teachers refine lesson plans overall as well as to ensure students of various skill and success levels receive the appropriate targeted instruction and interventions. So Avelar turned to someone she knew could help – her sister, Dr. Robin Avelar La Salle, a Stanford-educated teacher and administrator, and CEO of Principal’s Exchange. Because they are related, Avelar did not hire Principal’s Exchange. Instead, Avelar La Salle donated her time. “Principal’s Exchange provided us a roadmap to focus on curriculum, to bring teachers together to collaborate and to focus on instruction and a deep understanding of the standards,” Avelar said. They started with the state’s grade-level learning standards. Teachers began arriving at school a week before fall semester to review and prioritize state standards. They created assessments based on state standards and devised lesson plans to ensure students could master all standards. But the next step was the most critical: reflection on the data generated by the assessments. 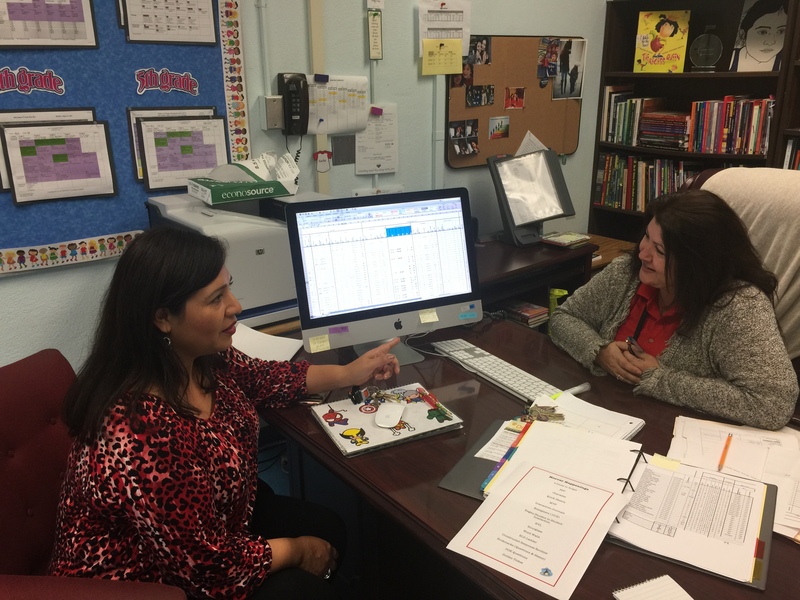 That data helps Avelar and her team allocate school resources – such as instructional coaches – where they are needed most and helps teachers adjust their instruction plans to boost effectiveness. It’s an ongoing effort to which the school dedicates two hours a week – with teachers sacrificing a staff meeting to make the time. 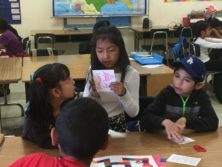 In classrooms, the transformation allows teachers to shift between full class lessons and smaller group lessons – such as the one in which Hailey led her team in playing the instruction-driven board game. The system also boosts student accountability. When students work in teams, the teacher selects a team member at random – by rolling dice, for example – to give an answer and explain why it is the correct one. Finally, the educators conduct frequent reviews of their strategies and goals to ensure that good tools don’t get forgotten. Avelar’s office is filled with data reports on the school’s performance as well as a living database that tracks student performance on school-based assessments, tallies intervention hours and outcomes, and identifies next steps to ensure success. The school also puts additional resources into hiring instructional coaches – such as Shantry – who regularly visit classrooms, model techniques, guide planning sessions and provide feedback. This follows another Principal’s Exchange mantra: If you expect, you must inspect. 0111816_PE_HOOVER_1: Hoover Street Elementary third-grader Hailey Pacheco, 8, checks English language arts answers that are part of a game that drives learning at the high-performing school, which has partnered with education consultant Principal’s Exchange to intensify instruction. 0111816_PE_HOOVER_2: Hoover Street Elementary School Instructional Coach Rosa Shantry, left, and Principal Martha Avelar discuss student performance tracked on a detailed spreadsheet. The data and methods for reviewing it are tools provided to the high-performing school by Principal’s Exchange, an education success consultant. 0111816_PE_HOOVER_1: Hoover Street Elementary third-grader Hailey Pacheco, 8, checks English language arts answers as part of a game that drives learning at the high-performing school.